Create an array of makeup looks with the Real Techniques Enhanced Eye Brush Set; a five-piece collection that covers any makeup addict’s needs. The set contains an array of brushes for expert eyeshadow application, as well as a brush tailored to eyeliner and a comb for volumising lashes. Delivering professional looking results, you can expect enviably enhanced eyes. Apply eyeshadow with ease using the Medium Shadow Brush. 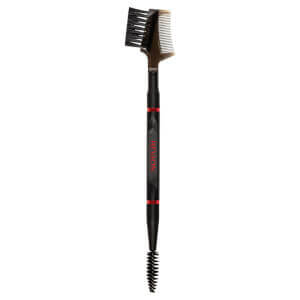 Crafted with a wide and flat brush head with tapered bristles, the makeup brush softly sweeps a wash of colour onto the lid. Suitable for both powder and cream eyeshadows, the shadow brush also blends product effortlessly. Expertly line and define your peepers with the Fine Liner Brush; the ultimate precision tool. Working with both cream and liquid eyeliners, the brush glides across the eye, evenly distributing product for an ultra-precise finish. 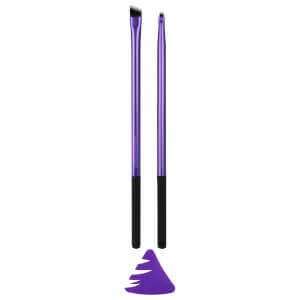 Achieve a bold eye makeup look with the sleek purple Shading Brush. The brush boasts a dense brush head with short bristles that are ideal for packing colour onto the lid, yet still providing even distribution. Expect intense colour pay off. Reveal full and flattering lashes using the Lash Separator; a fine toothed, metal comb that divides lashes and eliminates mascara clumps.